Back when, in less egalitarian days, when a corrupt copper and a bent squire could make the life of a working man not only miserable but deadly, there were few outlets for anonymous social protest that would allow dissenters to reveal wrongs or highlight hypocrisy and corruption without making themselves targets for retribution. 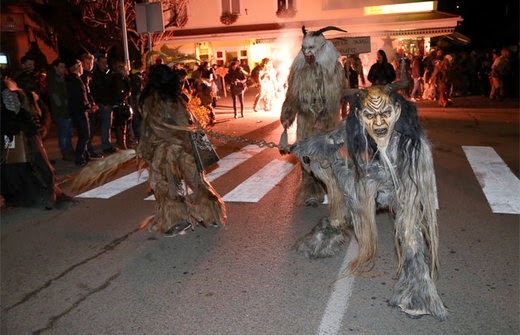 In Parts of southern Austria the safety valve was (and is) Perchtennacht; men dress as anonymous goat-headed demons and leap and roar at bystanders and smash oak staves loudly on the paving. Sometimes a watcher is hit hard by an oak stave. Or three. Or kicked in the balls. The 'accidental' victim is always either unpopular or guilty of some infraction against village ethics and the anonymous injuries are a message to either change behaviour or leave town. Not being present on the processional route (unless you're one of the Perchten) is an admission of guilt and of cowardice. It's rough, but effective. In England the favoured disguise for anonymous action was always a top hat or head-dress to distort height, a fractured costume to disguise body shape and of course soot to blacken the face. Then like the Perchten the Blacks could leap, roar and smash their Morris staves on the cobbles frighteningly strongly. As an exhibition of raw, furious, testosterone driven male aggression it is startlingly effective - and an unambiguous warning to those in authority that they rule only by popular consent. The Rochester Sweeps are the modern bowdlerised incarnation of the Blacks. 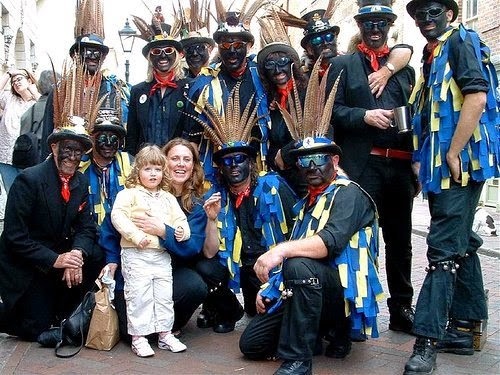 I'm only astonished that some dim-witted, ignorant, naive or stupid hack hasn't yet interpreted Rochester's historic tradition as 'racist'; but no doubt they would also condemn the Austrian Perchten as 'goatist'. Back in the days of my direct acquaintance with West Africa, before Nigerian oil, when life was little more civilised, Ghana and Nigeria enjoyed a sort of see-saw economic cycle. When one was doing well, the other was doing poorly, and vice-versa. Accra is separated from Lagos by a skinny strip of land that gives mini-nations Togo and Benin access to the Gulf of Guinea - generally migrants drive straight across it unhindered. And so with economic boom and bust a horde of migrants moved back and forth between the two cities. And when some diplomatic spat or financial disagreement caused the two governments to fall out, the consequences were felt by the migrants. They were simply expelled en masse; rounded up by the police and army where necessary, and sent packing. I remember seeing two pieces of news footage; one was of Ghanaians trekking westwards, a long walking column of chaps carrying washing machines on their heads, women bowed under the weight of huge blanket-wrapped bundles on their backs as they walked home. The second was of Nigerians expelled from Ghana walking eastwards, a long column of men with fridges on their heads and women dragging cloth-wrapped bundles on makeshift sleds. They're quite used to this sort of solution, you see. The hundreds of thousands now illegally in the UK would not be at all surprised and only slightly put-out to be marched onto a fleet of ferries moored at Southampton to take them home. It's the African way. Would Tony Benn have joined UKIP? The answer of course is no - on the basis that Benn's belief in a benign all-powerful central State exercising national command from the centre is a core tenet of Labour, Conservative and FlibDim policies but not UKIP's. Still, there's a certain meeting of minds as expounded by Steve Richards in the Guardian; Steve actually wonders if many Tories aren't closet Bennites whilst scrupulously avoiding the point that UKIP is undeniably Bennite in terms of a shared stance on the EU; Benn was against it on democratic grounds. Sure, he wanted a centralist dictatorship in the UK - but he wanted people to vote for it first. The former Tory MP and Ukip defector, Douglas Carswell, was typical in praising Benn in his Guardian interview last week: “Benn said the key questions were: who has power, who gave it to them, on whose behalf do they wield it, and are they accountable? I remember thinking this guy is spot on.” Separately, the founder of the ConservativeHome website, Tim Montgomerie, told me at a public event that he was a “Bennite on Europe”. He would advocate withdrawal whatever Cameron says or does, on the grounds that the EU can never be accountable to voters here or elsewhere. On another front, Benn started a campaign after the 1979 election to make Labour’s leadership and MPs more accountable to party members, supporting the right of local parties to deselect MPs. Benn’s crusade then has become, in a different form, the unrelenting mission of some Tory MPs now, or former Tory MPs. Carswell defected above all over the right of constituents to remove errant MPs – the project led by his former Conservative colleague, Zac Goldsmith. 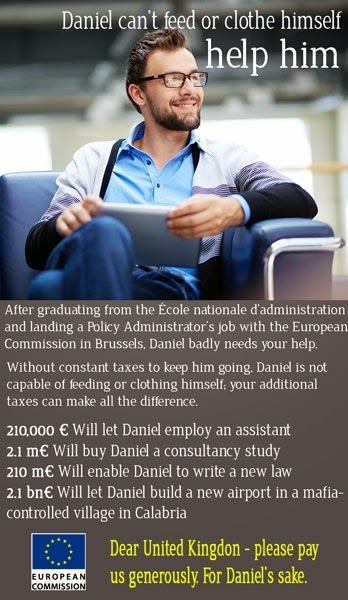 The Tory Bennites’ proposal, the right of recall, is a different measure to Benn’s, but the principle is similar. Constituents should hold MPs to account and not the national leadership. There must be a few creased brows and paused spoons of organic Goji Berry yoghurt at the breakfast tables of Guardianistas this morning.